I used to end up throwing out part of a package of bacon because I couldn’t use it all up before it went bad. Then, I began freezing it. 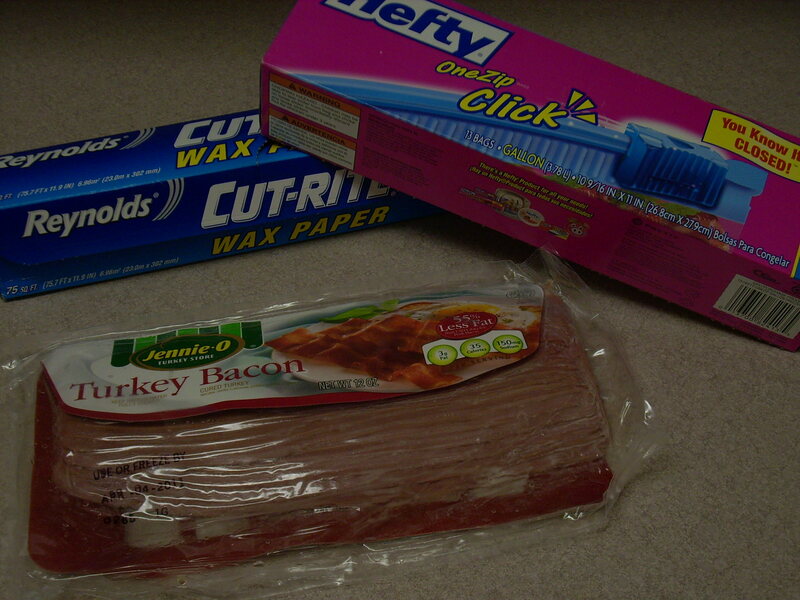 Now, the entire package of bacon gets used up which means no more wasted money. 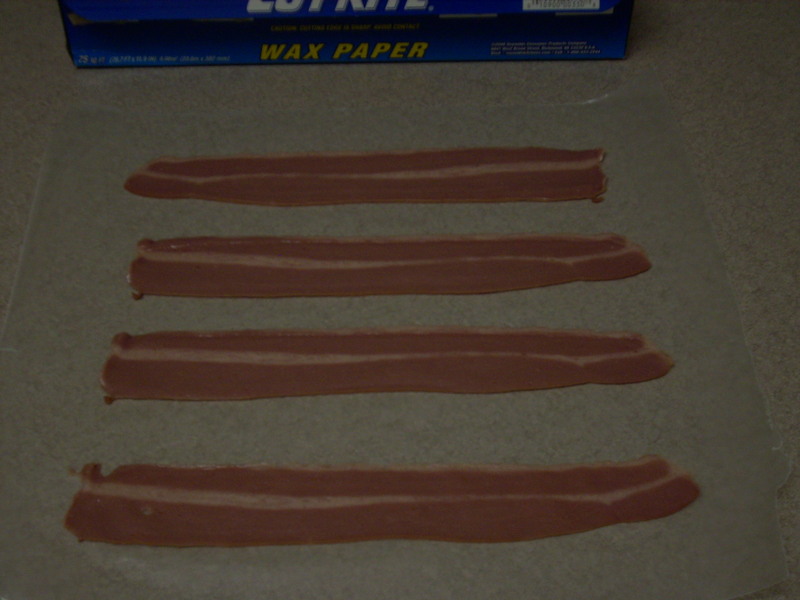 Freezing bacon is so simple and easy that I don’t know why I wasn’t doing it all along. What you will need. Wax paper, gallon size freezer bag, and um…..bacon. This works with Turkey Bacon or regular bacon. Tear off a sheet of wax paper that is a couple of inches longer than the length of the bacon. 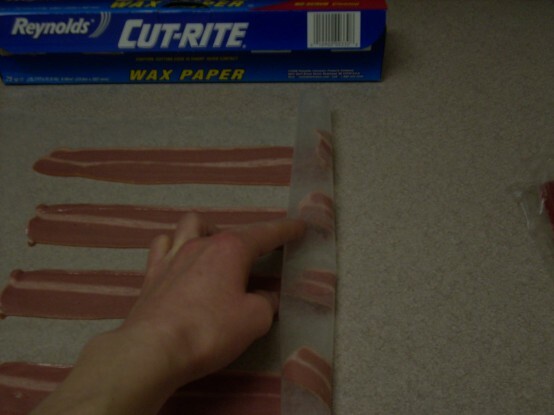 Place the strips of bacon onto the wax paper, centering them so that there is about an inch or so extending past the bacon on each side. I like to put four slices of bacon per sheet with an inch or so between each one. Then, you just start rolling it up- kind of like you would if you were making a jelly roll. 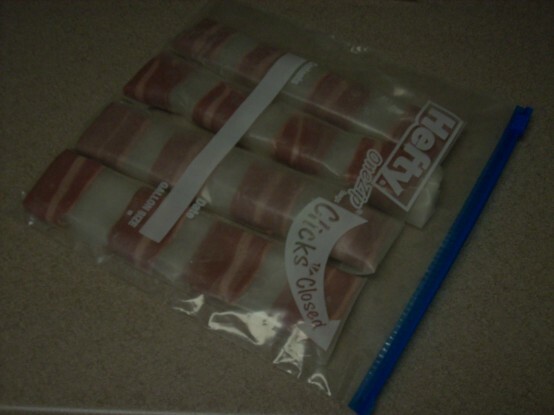 Fold the ends down on each side, and place into a freezer bag. 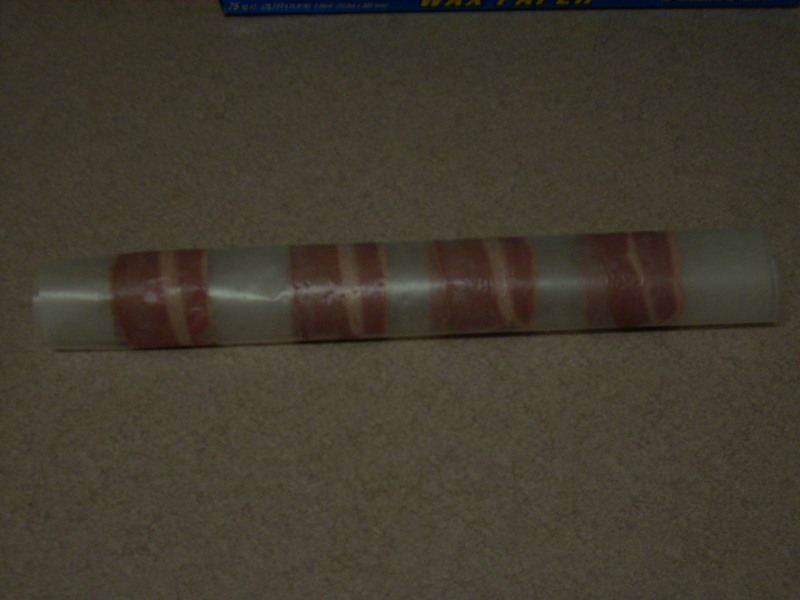 Continue until all of the bacon is rolled up, and placed into the freezer bag. Write that day’s date on the outside of the bag, and place into the freezer. I’ve taken Turkey Bacon directly from the freezer and cooked it without any problems. 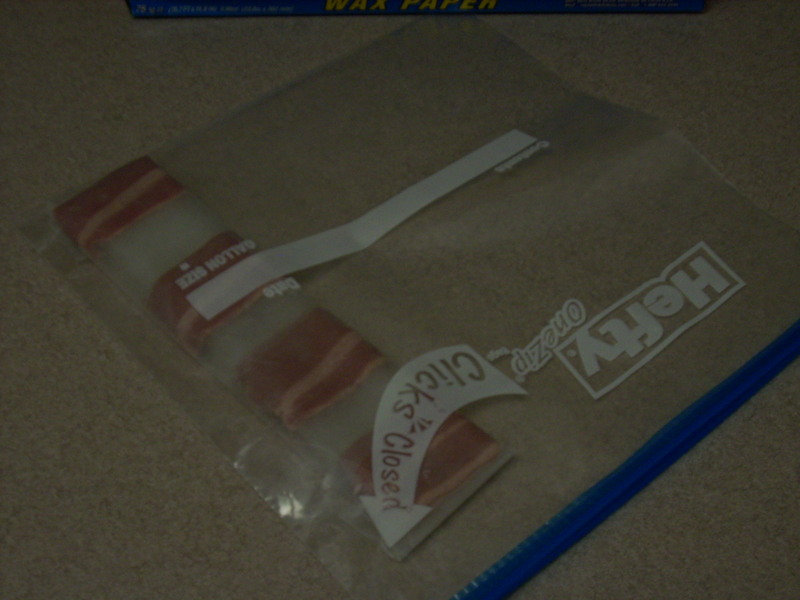 For raw bacon, let thaw in refrigerator overnight. 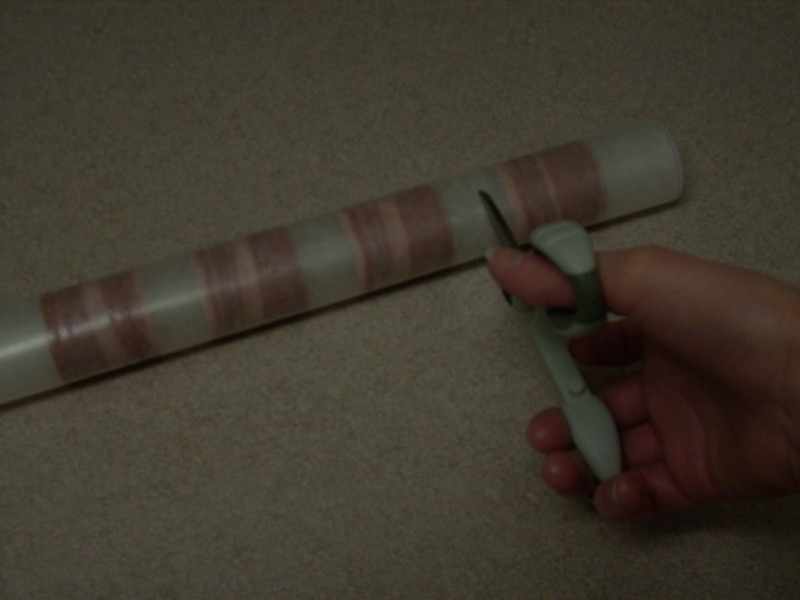 If you only need one or two slices, use some kitchen shears to cut the amount needed and unroll. Return the rest to the freezer. By Tempie at February 19, 2011 . So glad to find another Texan blog. We moved to Texas last year and are enjoying this very diverse culture here in Houston. I saw your comment on Sprinkle Bakes. Aren’t those flaming cupcakes awesome? I am definitely going to try them.